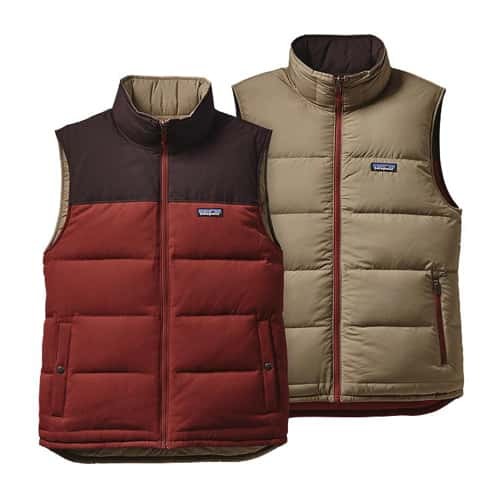 Patagonia Men's Reversible Bivy Down Vest is insulated with recycled down and is also reversible. It's like two vests in one! The Bivy Down Vest is water resistant and very warm. The reverse side is slick and smooth. Splitting wood in the yard or setting the crab trap in the bay, the Reversible Bivy Down Vest keeps your core warm when the weather is anything but. In a limber but durable full-zip design, it’s insulated with 600-fill-power 100% recycled down reclaimed from used down products and features a zip-through stand-up collar for warmth around the neck. The vest’s face side fabric is made of 100% nylon (51% recycled) plain weave with a DWR (durable water repellent) finish and a cotton-like look and feel; a reinforced yoke offers an extra barrier for weather protection. The reverse side fabric is a windproof, 100% recycled polyester ripstop with a DWR (durable water repellent) finish and a more technical look and feel. Face side has two insulated side-entry pockets with snap-button closures; reverse side has two insulated side-entry pockets with zipper closures for additional security. All pockets are lined with microfleece for warmth and comfort. Hip length with drop-tail hem.